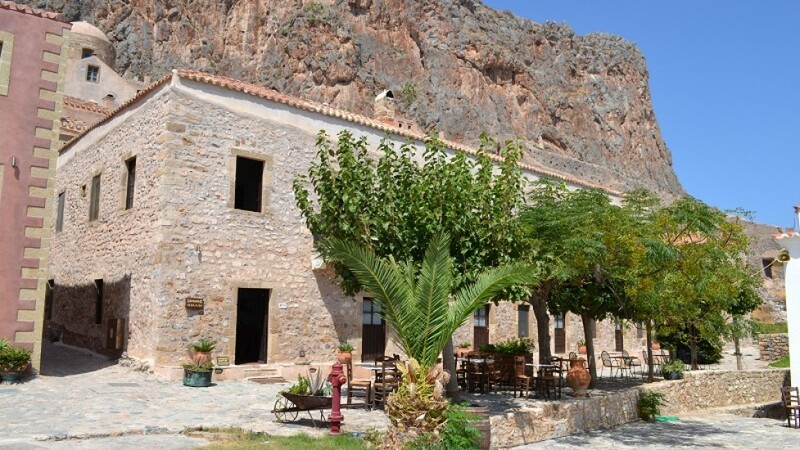 We welcome you tο the Castle of Monemvasia and our traditional guesthouse «Kellia». This, well preserved, traditional building where you have chosen to spend quiet, pleasant and, hopefully, unforgettable moments, was the place where our renowned Greek poet Giannis Ritsos was born. The building, which historically is referred to as a monks residence, the so called “kellia”, hence its name, operated for the first as a traditional guesthouse in 1981, under the auspices of the Hellenic Tourism Organization, as part of a pilot project of construction and operation of traditional guesthouses in selected areas and destinations of our country, from well trained staff in collaboration with the local authorities and inhabitants. The final scope of this program was to offer the locals and young entrepreneurs the know- how, expertise and training on the tourism business, so that, they would thereafter take over the management from the Hellenic Tourism Organization and operate the facility on their own. We have been managing the guesthouse since July 2011, following a thorough restoration in all the rooms, facilities and common areas, so as to create an elegant, plain yet fully functional guesthouse, to provide warm and well cared hospitality to our visitors. The magic silence which travels the senses on a magic journey over the “rocky ship” of our poet, the waves which seem to siege the rock, the moon which stimulates all senses, the shadow of the mulberry tree in high summer and the cool, white wine which we will serve you during sunset, are, we believe, all that a visitor to Monemvasia is looking for: a majestic journey, a romantic dream, a total escape from the daily routine and most of all, a warm, hospitable feeling… After all, there is nothing more important than a lovely stay in this lovely place! Moreover, at the castle’s main cobblestone alley you will find our own cellar, which is also the oldest local- products store in the castle. Especially for our guests staying at “Kellia”, we offer exclusive prices on all local products at producers’ prices. You can try local wines, home made marzipan sweets and samousades (the Spartan version of baklavas, filled with almonds and sesame and flavoured with many spices, cinnamon, nutmeg), honey wine and tsipouro, as well as plenty of other local delicacies.